1. Status of Northern Ireland as part of United Kingdom. 2. Initial devolution of legislative and executive responsibility. 3. Alterations in devolved responsibilities. 4. Measures of Northern Ireland Assembly. 5. Secretary of State's consent for proposed Measures dealing with excepted or reserved matters. 6. Parliamentary control of Measures dealing with excepted or reserved matters. 7. Executive authorities in Northern Ireland. 8. The Northern Ireland Executive. 9. Remuneration and pensions of members of Northern Ireland Executive etc. 10. Attorney General for Northern Ireland. 11. Agency arrangements between United Kingdom and Northern Ireland departments. 12. Consultation, agreements and arrangements with Republic of Ireland. 13. Consolidated Fund of Northern Ireland. 14. Proceedings in Assembly for imposing charge on public funds or for imposing taxation. 15. Payment to Northern Ireland of share of United Kingdom taxes. 16. Grants to Northern Ireland out of moneys provided by Parliament. 18. Special procedure for determining validity of legislation. 19. Discrimination by public authorities. 20. The Standing Advisory Commission on Human Rights. 21. Unlawful oaths, undertakings and declarations. 22. Removal of restrictions on investigation into maladministration. 24. Presiding officer and Clerk of the Assembly. 28. Constituencies and number of members. 30. Disqualification for membership of Assembly. 31. Abolition of Parliament of Northern Ireland. 32. Abolition of office of Governor and provisions as to Privy Council of Northern Ireland. 33. Preservation of pension rights of former members of Parliament of Northern Ireland and former Ministers. 34. Director of Public Prosecutions for Northern Ireland. 35. Crown Solicitor for Northern Ireland. 36. Provisions as to other Northern Ireland officers. 37. Provisions as to Joint Exchequer Board and other financial matters. 38. Power to legislate by Order in Council for certain matters relating to Northern Ireland. 39. Power to legislate by Order in Council for purposes consequential on this Act or on Orders under s. 3. 40. General adaptation of references to institutions and offices abolished by this Act. 42. Saving for existing laws. 43. Short title, interpretation and commencement. Schedule 1- Polls for purposes of section 1. Schedule 3- Minimum reserved matters on appointed day. Schedule 4- Form of oath or affirmation under section . Schedule 5- General adaptation of references to institutions and offices abolished by this Act. (a) that the Northern Ireland Assembly (in this Act referred to as "the Assembly") has made satisfactory provision by its standing orders for the purposes mentioned in section 25(2) to (5) below ; and Initial devolution of legislative and executive responsibility. and that having regard to those matters there is a reasonable basis for the establishment in Northern Ireland of government by consent, he shall lay before Parliament the draft of an Order in Council appointing a day for the commencement of Part II of this Act and declaring what matters shall, subject to section 3 below, be transferred matters for the purposes of this Act. (b) any of the matters specified in Schedule 3 to this Act. (3) If the draft laid before Parliament under subsection (1) above is approved by resolution of each House of Parliament the Secretary of State shall submit it to Her Majesty in Council and Her Majesty in Council may make the Order in terms of the draft. 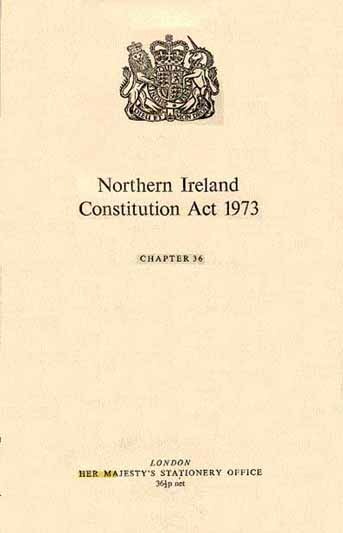 (4) On the day appointed by an Order under this section for the commencement of Part II of this Act (in this Act referred to as "the appointed day") section 1 of the Northern Ireland (Temporary Provisions) Act 1972 shall expire. 1972 c. 22. (a) that any matter (not being an excepted matter) which is not a transferred matter by virtue of an Order under section 2 above or a previous Order under this section should become a transferred matter; or devolved responsibilities. he may, subject to subsection (2) below, lay before Parliament the draft of an Order in Council declaring that the matter shall be or, as the case may be, shall cease to be a transferred matter with effect from such date as may be specified in the Order. (2) The Secretary of State shall not lay before Parliament the draft of an Order in Council declaring that any matter not specified in Schedule 3 to this Act shall cease to be a transferred matter unless the Assembly has passed a resolution praying that it should cease to be a transferred matter. (3) Subsection (3) of section 2 above shall have effect in relation to any draft laid before Parliament under this section as it has effect in relation to a draft laid before Parliament under that section. (4) Any matter (not being an excepted matter) which is not for the time being a transferred matter is in this Act referred to as a "reserved matter ". 17. (1) Any Measure, any Act of the Parliament of Northern Ireland and any relevant subordinate instrument shall, to the extent that it discriminates against any person or class of persons on the ground of religious belief or political opinion, be void. Discrimination in legislation. (2) In this section "relevant subordinate instrument" means an instrument of a legislative character (including a byelaw) made (whether before or after the coming into force of this section) under any Act of the Parliament of the United Kingdom or the Parliament of Northern Ireland or under any Measure and extending only to Northern Ireland or a part of Northern Ireland. 18. (1) If it appears to the Secretary of State to be expedient in the public interest that steps should be taken for the speedy decision of any question whether a provision of a Measure, Act of the Parliament of Northern Ireland or relevant subordinate instrument within the meaning of section 17 above is void by virtue of that section, he may recommend to Her Majesty that the question be referred for decision to the Judicial Committee of the Privy Council. Special procedure for validity of legislation. he shall recommend to Her Majesty that the question whether that provision would be void by virtue of the said section 17 be referred for decision to the Judicial Committee of the Privy Council. (3) For the purposes of their consideration of any question referred to them under this section the Judicial Committee may hear any person who appears to them to be interested in the determination of that question. (4) The decision of the Judicial Committee under this section as to the validity of any provision shall be stated in open court and shall be binding in all subsequent legal proceedings. (5) Where the Judicial Committee decide that a provision in a proposed Measure would be void the Secretary of State shall not submit the proposed Measure for the approval of Her Majesty in Council; and where they decide that such a provision would not be void their decision shall be taken as applying also to that provision if contained in the Measure when enacted. (6) Subsection (6) of section 5 above shall apply where the Secretary of State is precluded by subsection (5) above from submitting a proposed Measure for approval as it applies where he withholds his consent under that section and as if the reference to subsection (5) of that section included a reference to subsections (2) and (5) above. (7) This section is without prejudice to any power of Her Majesty to refer to the Judicial Committee any questions other than those mentioned in this section. 19. (1) It shall be unlawful for a Minister of the Crown, a member of the Northern Ireland Executive or other person appointed under section 8 above, the Post Office and any authority or body listed in Schedule 2 to the Parliamentary Commissioner Act 1967, Schedule 1 to the Parliamentary Commissioner Act (Northern Ireland) 1969 or Schedule 1 to the Commissioner for Complaints Act (Northern Ireland) 1969 to discriminate, or aid, induce or incite another to discriminate, in the discharge of functions relating to Northern Ireland against any person or class of persons on the ground of religious belief or political opinion. Discrimination by public authorities. (2) The obligation to comply with subsection (1) above is a duty owed to any person who may be adversely affected by a contravention of that subsection, and any breach of that duty is actionable in Northern Ireland accordingly. and the court may, if satisfied as to those grounds and whether or not damages are awarded, grant such injunction as appears to the court to be proper in all the circumstances, being an injunction restraining the defendant from doing, or causing or permitting others to do, further acts of the same or a similar kind. 20. (1) There shall be constituted a Commission to be known as the Standing Advisory Commission on Human Rights (and hereafter in this section referred to as the Advisory Commission) for the purpose of- The Standing Advisory Commission on Human Rights. (b) keeping the Secretary of State informed as to the extent to which the persons, authorities and bodies mentioned in section 19(1) above have prevented discrimination on either ground by persons or bodies not prohibited from discriminating by that law. and any member mentioned in paragraphs (b) to (d) above is hereafter in this section referred to as an ex-officio member. (3) An ex-officio member of the Advisory Commission shall on ceasing to hold the office by virtue of which he is a member of the Commission cease to be a member of the Commission and, if he is the chairman, to be chairman. (4) The members of the Advisory Commission, other than the ex-officio members, shall hold and vacate office in accordance with the terms of their respective appointments and shall, on ceasing to hold office, be eligible for re-appointment, but any such member may at any time by notice addressed to the Secretary of State resign his office. (5) The Secretary of State may out of moneys provided by Parliament pay the members of the Advisory Commission, other than the ex-officio members, such remuneration and such allowances as may be determined by the Secretary of State with the consent of the Minister for the Civil Service. (6) The Secretary of State shall provide the Advisory Commission with such officers and such accommodation as may be appropriate. (7) The Advisory Commission shall make annual reports to the Secretary of State with respect to the exercise of their functions and make copies of those reports available to the Assembly; and the Secretary of State shall lay any such report before each House of Parliament. but, except as aforesaid, has effect notwithstanding anything in any enactment, any Measure or any instrument made under an enactment or a Measure. (3) Subsection (1) above shall not prevent a person being required to make a declaration of acceptance of office or a declaration that he is qualified to act, serve or be employed, or not disqualified from acting, serving or being employed, in any capacity. (4) This section applies to the Assembly and to any authority or body listed in Schedule 1 to the Parliamentary Commissioner Act (Northern Ireland) 1969 or Schedule 1 to the Commissioner for Complaints Act (Northern Ireland) 1969. 1969 c. 10 (N.I.). 1969 c. 25 (N.I.). (5) Subsections (1) to (3) above shall apply with the necessary modifications to a member of the Northern Ireland Executive or other person appointed under section 8 above as they apply to any such authority or body. (6) Subsections (2) and (3) of section 19 above shall apply in relation to subsection (1) above as they apply in relation to subsection (1) of that section. 22. (1) The enactments mentioned in subsection (2) below (which preclude a Commissioner appointed under any of the Acts so mentioned from conducting an investigation under the relevant Act when the person aggrieved has or had a remedy investigation by way of proceedings in a court of law) shall not apply to an investigation of a complaint alleging maladministration involving discrimination on the ground of religious belief or political opinion or a requirement in contravention of section 21 above to take an oath or make an undertaking or declaration. Removal of restrictions on investigation into maladministration. (b) section 5(2)(b) of the Parliamentary Commissioner Act (Northern Ireland) 1969; and 1969 c. 10. (c) section 5(3)(b) of the Commissioner for Complaints Act (Northern Ireland) 1969. (N.I.). 23. (1) For the purposes of this Part of this Act a Measure, an Act of the Parliament of Northern Ireland or any other instrument discriminates against any person or class of persons if it treats that person or that class less favourably in any circumstances than other persons are treated in those circumstances by the law for the time being in force in Northern Ireland. Interpretation and supplemental. (2) For those purposes a person discriminates against another person or a class of persons if he treats that other person or that class less favourably in any circumstances than he treats or would treat other persons in those circumstances. (3) No Measure, Act of the Parliament of Northern Ireland or other instrument and no act done by any person shall be treated for the purposes of this Act as discriminating if the instrument has the effect, or, as the case may be, the act is done for the purpose, of safeguarding national security or protecting public safety or public order. (4) A certificate purporting to be signed by or on behalf of the Secretary of State and certifying that an act specified in the certificate was done for the purpose of safeguarding national security shall be conclusive evidence that it was done for that purpose. (5) No provision of this Part of this Act shall affect the operation before the coming into force of that provision of any Measure, Act of the Parliament of Northern Ireland or other instrument. (6) No provision of this Part of this Act shall render unlawful anything required or authorised to be done by any Act of the Parliament of the United Kingdom, whenever passed. 24. (1) The Assembly elected under the Northern Ireland Assembly Act 1973, and every Assembly subsequently elected, shall as its first business elect one of its members to be the presiding officer of the Assembly. Presiding officer and Clerk of the Assembly. (2) The person so elected shall hold office until the dissolution of the Assembly unless he previously resigns or ceases to be a member of the Assembly or is removed from office by resolution of the Assembly: and if the presiding officer vacates his office before the expiration of his term of office the Assembly shall elect another person to fill his place for the remainder of that term. (3) There shall be a Clerk to the Assembly appointed by Her Majesty on the recommendation of the Secretary of State. (4) The Clerk to the Assembly shall, with the consent of the Ministry of Finance for Northern Ireland as to numbers, appoint such other officers and servants of the Assembly as he considers requisite. (5) The remuneration of the Clerk to the Assembly shall be such as may be determined by the Ministry of Finance for Northern Ireland; and the remuneration and conditions of service of the other officers and servants of the Assembly shall be such as may be determined by the Clerk to the Assembly with the consent of that Ministry. (6) The remuneration of the Clerk to the Assembly shall be charged on and paid out of the Consolidated Fund of Northern Ireland and the remuneration of the other officers and servants of the Assembly shall be defrayed out of moneys appropriated by Measure. (7) The Clerk to the Assembly shall act as presiding officer while that office is vacant pending an election under subsection (1) or (2) above. (8) Any functions of the Clerk to the Assembly (including functions under section 5 above or under subsection (7) above) may, if the office of Clerk is vacant or the Clerk is for any reason unable to act, be discharged by any other officer for the time being discharging the duties of the Clerk. 25. (1) The Assembly shall make standing orders for regulating its procedure. (2) The standing orders shall include provision- Procedure. (c) for a final stage at which a proposed Measure can be passed or rejected but not amended. (3) The standing orders shall include provision for the procedure to be adopted where the Secretary of State has withheld his consent to a proposed Measure under subsection (3) of section 5 above or has referred a proposed Measure back to the Assembly for further consideration. (4) The standing orders shall include provision for the establishment of consultative committees to advise and assist the head of each of the Northern Ireland departments in the formulation of policy with respect to matters within the responsibilities of his department, and a committee may be so established either in relation to a single department or in relation to more than one. (5) Standing orders made by virtue of subsection (4) above shall, subject to subsection (6) below, provide for the head of the department or the heads of departments in relation to which a consultative committee is established to be chairman or joint chairmen of that committee and shall make provision for securing that the balance of parties in the Assembly is, so far as practicable, reflected in the membership of the consultative committees taken as a whole. (6) Her Majesty may by Order in Council repeal or amend so much of subsection (5) above as relates to the chairmanship of consultative committees and make such consequential or transitional provision in connection with the repeal or amendment as appears to Her Majesty to be necessary or expedient; but the power to make Orders under this subsection (which includes power to vary or revoke a previous Order) shall not be exercisable before the appointed day and no recommendation shall be made to Her Majesty to make such an Order unless a draft of it has been approved by resolution of each House of Parliament. (7) The standing orders may provide for enabling a consultative committee to obtain from any department in relation to which it is established such information as the committee may require for the purpose of discharging its functions but shall not enable the committee or any member thereof to have access to any papers of that department. (8) The standing orders shall include provision for the examination by a committee of the Assembly of the manner in which moneys charged on or appropriated out of the Consolidated Fund of Northern Ireland have been applied. (9) The Secretary of State may give directions for regulating the procedure of the Assembly so far as he considers requisite pending the making of standing orders by the Assembly. (10) Subsection (8) above does not apply to the application of moneys before the appointed day. 26. (1) The powers, privileges and immunities of the Assembly and of the members and committees thereof shall be the same as those for the time being held and enjoyed by the House of Commons and its members and committees but this subsection has effect subject to section 25(7) above and to any provision made by Measure. Privileges, remuneration, etc. (2) There shall be paid to each member of the Assembly such salary and allowances as may be prescribed by Order in Council; and provision may be made by Order in Council for the payment of pensions to or in respect of persons who have been members of the Assembly. (3) Any salary or allowances payable to a member by virtue of an Order in Council under subsection (2) above shall accrue from the date on which he is returned as a member but shall not be payable unless he takes his seat in the manner prescribed by standing orders. (4) Special provision may be made by Order in Council under subsection (2) above in respect of the member who is the presiding officer of the Assembly and in respect of such other members (if any) as may be elected by the Assembly to discharge other functions in relation to the Assembly. (5) Any salaries or allowances payable by virtue of an Order under subsection (2) above, and any sums required by such an Order relating to pensions to be paid out of public funds, shall be defrayed out of moneys appropriated for that purpose by Measure. (6) Any Order in Council under subsection (2) above may be varied or revoked by a subsequent Order. (7) A member of the Assembly may resign his seat by giving notice in writing to the presiding officer of the Assembly; and if a seat becomes vacant by resignation, death or disqualification the presiding officer shall as soon as practicable inform the Assembly thereof. (9) Subsection (5) above shall, as from the appointed day, apply to any salaries or allowances payable under the said section 1(5). 27. (1) The Assembly elected under the Northern Ireland Assembly Act 1973 shall by virtue of this subsection be dissolved- Dissolution and prorogation. (b) if no Order in Council is so made, on 30th March 1974. (b) if its predecessor was dissolved by virtue of paragraph (b) of subsection (1) above and no Order in Council is made under section 2 above before the expiration of the period of six months beginning with the day on which it was elected, at the expiration of that period. (3) If, apart from this subsection, the date of dissolution under subsection (1) (a) or (2) above would fall on a Saturday, Sunday or public holiday it shall fall on the next subsequent day which is not a Saturday, Sunday or public holiday. (4) The Secretary of State may by order direct that any date of dissolution under paragraph (a) of subsection (1) or (2) above shall, instead of being determined in accordance with that paragraph and subsection (3) above, be a date specified in the order, being a date falling not more than two months before or after the date so determined. (5) If it appears to Her Majesty that the composition of the Assembly is such that it is not possible for the Secretary of State to make appointments under section 8 above which comply with the requirements of subsection (4) of that section and that it is in the public interest that the Assembly should be dissolved, Her Majesty, after taking into account any vote or resolution of the Assembly which appears to Her Majesty to be relevant, may by Order in Council direct that the date of dissolution for the Assembly, instead of being determined in accordance with the foregoing provisions of this section, shall be such earlier date as may be specified in the Order. (6) In any case in which an Order could be made under subsection (5) above Her Majesty may, instead of or before making an Order under that subsection, by Order in Council prorogue or further prorogue the Assembly. (7) If the Assembly is dissolved in accordance with subsection (1) (b) or (5) above Her Majesty may by Order in Council appoint a day foe the election of members of a new Assembly; and the first meeting of the new Assembly shall be held on such day as the Secretary of State may by order direct. (8) An Order in Council under this section may be varied or revoked by a subsequent Order and, except in the case of an Order proroguing the Assembly for a period of four months or less and not extending a previous period of prorogation, no recommendation shall be made to Her Majesty to make an Order under this section unless a draft of it has been approved by resolution of each House of Parliament. (9) Any power of the Secretary of State to make an order under subsection (4) or (7) above includes power to vary or revoke a previous order and, in the case of an order under subsection (4), shall be exercisable by statutory instrument subject to annulment in pursuance of a resolution of either House of Parliament. (10) An Order in Council under this section proroguing the Assembly shall specify the period of prorogation and the Assembly shall meet at the expiration of that period but without prejudice to the power of Her Majesty to recall it earlier and subject to any further prorogation or any dissolution by or under this section before the expiration of that period. 28. (1) Section 1(2) of the Northern Ireland Assembly Act 1973 and the Schedule to that Act (which provide foe the members of the Assembly to be returned for the constituencies in Northern Ireland which would return members to the Parliament of the United Kingdom if a general election were held at the passing of that Act and specifies the number of members to be returned by each constituency) shall apply also in relation to any subsequent election of members of the Assembly and, subject to subsection (6) below, shall so apply as if for the reference to the passing of that Act there were substituted a reference to the date on which the election is held. Constituencies and number of members. 1973 c. 17. (2) Where the Boundary Commission for Northern Ireland submit to the Secretary of State a report under section 2(1) or (3) of the House of Commons (Redistribution of Seats) Act 1949 showing the constituencies into which the whole of, or any area in, Northern Ireland should be divided they shall submit therewith a supplementary report showing the number of members which they recommend should be returned to the Assembly by each of those constituencies. 1949 c. 66. (3) The recommendations in a supplementary report shall not be such as substantially to alter the number of members specified in section 1(1) of the said Act of 1973 (total number of members of Assembly); and those recommendations shall be such as to secure, so far as practicable, that the ratio of the electorate of each constituency to the number of members to be returned by that constituency is the same in every constituency. In this subsection "the electorate ", in relation to a constituency, means the number of persons whose names appear on the register of electors for that constituency in force on the enumeration date (as defined in Schedule 2 to the said Act of 1949) under section 29 below. (4) Section 2(4) and (5) and section 3 of the said Act of 1949 (publication of notice of proposed report of Boundary Commission and implementation of recommendations in report) shall apply to a supplementary report under this section as they apply to a report under that Act. (5) An Order in Council under the said Act of 1949 for giving effect, with or without modifications, to the recommendations contained in a report or supplementary report of the Boundary Commission for Northern Ireland may amend section 1(1) of the said Act of 1973 by altering the number of members there specified and may amend the Schedule to that Act by altering the name of any of the constituencies there mentioned or the number of members there specified in relation to any constituency. (6) Any provision of an Order in Council under the said Act of 1949 altering the boundaries of any constituency in Northern Ireland or the number of members specified in the said section 1(1) or the said Schedule in relation to any constituency shall not affect any election to the Assembly before the next general election to the Assembly or affect the constitution of the Assembly then in being. (7) The officers of the Boundary Commission foe Northern Ireland shall include the Chief Electoral Officer for Northern Ireland as an additional assessor. 29. (1) The following provisions of section 2 of the Northern Ireland Assembly Act 1973, that is to say- Elections and franchise. 1973 c. 17.
shall apply also to any subsequent election of members of the Assembly, including bye-elections. (2) The provision that may be made by an order under sub- section (5) of the said section 2 as extended by this section shall include provision for determining, subject to section 27(7) above, the date of the poll for any such subsequent election, provision as to the persons entitled to vote at any such election and the registration of such persons and provision for such other matters relating to any such election as the Secretary of State thinks necessary or expedient. 30. (1) For section 10 of the House of Commons Disqualification Act 1957 (which applies certain provisions of that Act to the Senate and House of Commons of the Parliament of Northern Ireland) there shall be substituted- Disqualification for membership of Assembly. 1957 c. 20. (b) Parts I, II and III of Schedule 1, Assembly. shall apply in relation to the Northern Ireland Assembly as they apply in relation to the House of Commons of the Parliament of the United Kingdom, and references in those provisions to the House of Commons shall be construed accordingly. (2) In relation to the Northern Ireland Assembly for Parts II and III of Schedule 1 to this Act there shall be substituted the Parts set out in Schedule 3 to this Act." (2) In Schedule 3 to the said Act of 1957 the heading shall be changed to "Provisions substituted foe Parts II and III of Schedule 1 in relation to Northern Ireland Assembly" and all the other provisions of that Schedule except the substituted Parts II and III shall be omitted. (3) In section 3 of the Northern Ireland Assembly Act 1973 (disqualification for membership of Assembly) in subsection (1) for the words from "a person is disqualified for membership of the Assembly" onwards there shall be substituted the words "a person is disqualified for membership of the Assembly if he is disqualified for membership of the Commons House of the Parliament of the United Kingdom otherwise than by the House of Commons Disqualification Act 1957" and in subsection (3) of that section references to a disqualification imposed by that section shall include references to a disqualification imposed by the said Act of 1957 as amended by this section. 1973 c. 17.